Bangkok (Thailand) – May 21, 2018 (travelindex.com) – As the old saying goes “There are fish in the waters. There is rice in the fields”, this saying truly reflects the greatness of Thailand, the kingdom of food. Thailand’s rich culture, art, and tradition that passed down from generation to generation have selectively created the unique taste of Thai cuisine. 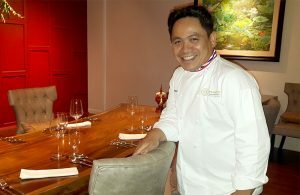 R-HAAN restaurant focuses on the heart of Thai cookery. Each menu is seasoned and cooked by highly experienced Thai food chef with only the best ingredients as strictly prescribed by traditional recipes. No wonder each dish is filled with the charm of Thai cuisine. Each dish served on the table not only represents the true taste of Thai food, but also reflects the art of royal utensils during the Rattanakosin Era. Every single menu is presented on a beautiful and hand-crafted utensil made by professional crafters. This truly shows how R-HAAN is committed to the best. The real traditional Thai cuisine and the happiness from every single delicious bite are what R-HAAN strives for. From inspiration to reality, Chef Chumpol Jangprai, or widely known as the “master chef” of Thai cuisine, has spent his entire life learning, experimenting, and developing his Thai recipes including researching and sourcing the best local ingredients. Today, Chef Chumpol and his partner, Mr. Piti Bhirombhakdi, Thailand’s famous Food and Beverage company heir, are ready to pursue their dream of presenting the essence of authentic Thai food and the charm of Thai cuisine. From the profound love for authentic Thai food, the fine-dining Thai restaurant called R-HAAN was finally launched and is ready to serve you the best experience of Thai cuisine. The Wisdom of Thai Cuisine comprises 5 elements. Thailand is fortunate to have abundant “local food ingredients”. R-HAAN selects only the best ingredients from every corner of Thailand such as Red Snapper from Bang Pakong, Flower Crab from Pak Nam Bangtapoon, “Kam Pang San” specially-fed Thai Beef, chilies from Ratchaburi, and jasmine rice from both the northeastern and the northern parts of Thailand. The best ingredients are then mixed with seasonings using heating process to blend all ingredients and seasonings together at perfect timing. The heat does not only cook the ingredients, but also helps the dish look colorful. With the balance of ingredients, seasonings, timing and heat, the signature well-rounded taste of Thai food which includes the basic five tastes of sourness, sweetness, creaminess, saltiness, and spiciness is created. In addition to these 5 basic tastes, the true authentic Thai cuisine also gives distinctive tastes of slight bitterness and zesty that usually linger on your taste buds. This combination of signature tastes is the charm of Thai cuisine. This is where the chef’s passion and fresh ingredients come together to create the perfect menu at R-HAAN. R-HAAN restaurant focuses on the wisdom of Thai cuisine which combines Thai culture and abundant local ingredients with both old-school and modern cooking procedures. In R-HAAN’s kitchen, the traditional charcoal stove and modern cooking machines are both used. A set of variety of dishes (Samrub) is served at the center of the table to be shared among diners as per Thai dining tradition. At least 18 menus are included in one meal and may include special seasonal menu from the chef. This set of menus is carefully created to balance a variety of flavors and tastes from each dish, which are designed to complement each other, just the way Thai food should be. This is part of the menu created from the best of local ingredients from every corner of Thailand. The menu is changed every season according to the date of the changing of the Emerald Buddha’s seasonal costume. The best of Thai Samrub starts with “Kanom Krok Cream Tom Kha Caviar Krongkarn Luang Doi Indhanon”. This extraordinary Amuse-Bouche is made from Coconut cream infused with galangal and comes in a Thai Takoyaki style. The seasonal Indhanon caviar on the top makes a perfect crunchy topping. The sensation from Amuse-Bouche is followed by three kinds of appetizers served on a golden tray. The first one is freshly-made Thai rice noodle to be eaten with Great Grand Mother Sa-Guan Sri’s recipe chili dip. Another authentic Thai appetizer is Royal Thai crispy vermicelli rice noodle coated with edible gold leaf. The last appetizer is “Thod Mun Pla Grai Pak Naam Pho” which is fish cake made from Pak Naam Pho river fish served with three flavors Sphere. This course (Royal Thai Samrub Eak) finishes with Thai desserts and the finale Petit Fours which are freshly made daily according to Royal Thai’s sweets recipe.